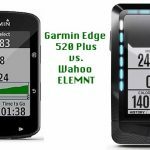 In this post (with videos), we offer an in-depth comparison of the Garmin Edge 520 Plus vs Wahoo ELEMNT. The Garmin Edge 520 Plus is a major upgrade to the Edge 520, which was itself hailed as pretty much the greatest bike computer upgrade ever. However, the Edge 520 had certain shortcomings, so that the Wahoo ELEMNT was serious competition. In fact, in a previous post comparing the Edge 520 vs Wahoo ELEMNT, our bottom line was that we thought that Wahoo was slightly better. However, Garmin did not take this competition lying down, and responded with a major upgrade – the new Edge 520 Plus. So, how did Garmin do? Is the new Garmin Edge 520 Plus better than its competitor, the Wahoo ELEMNT? 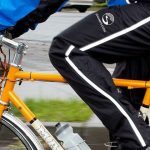 This post compares the features of these premium bike computers to help you decide which would be best for you. First, here is a chart that compares their key features. SIze: 1.9" x 2.9" x 0.8"
Battery Life: Claimed up to 15 hours. But it depends what you do with the unit – e.g. 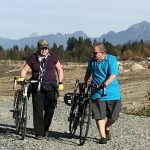 are you using backlight, GPS, connecting constantly to your smart phone, etc.? Claimed up to 15 hours. But it depends what you do with the unit – e.g. are you using backlight, GPS, connecting constantly to your smart phone, etc.? Can you program it with a smart phone? No; you use buttons and menus and sub-menus on the unit to program it Yes, and it is easy and fun! 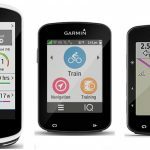 As you can see at a glance, both the Wahoo ELEMNT and the Garmin Edge 520 Plus are premium bike computers that offer an impressive range of features. So, which one is better for you? Read on! 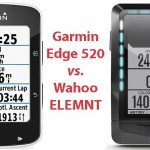 Garmin Edge 520 Plus vs Wahoo ELEMNT – which one is for you? The Garmin Edge 520 Plus, like all Edge bike computers, is a rugged bike computer that will stand up to bad weather, and even a fall into water. Plus of course it will enable you to record your rides and a range of other data and upload it automatically to the apps of your choice. The Wahoo ELEMNT is just as rugged and water-resistant, and will also enable you to record and automatically upload your rides and a whole lot of other data. On the other hand, depending on your preferences, you might find that the Wahoo ELEMNT does have some significant advantages over the Edge 520 Plus. 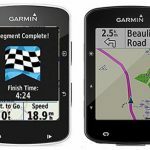 When the Garmin Edge 520 was first introduced, it was hailed by many as the biggest leap forward in bike computers, ever – as we mentioned in our complete review of the Garmin Edge 520. Now, a couple of years later, it has been upgraded even further with improved maps and navigation. The Edge 520 Plus is GPS and GLONASS-enabled (that’s the US and Russian systems). This enables extremely fast satellite acquisition, and offers wireless transfers of your data to Garmin Connect (or Strava, which you can read about here) – or whichever cycling app you choose. The Edge 520 Plus connects to a wide range of cycling apps, via Connect IQ. These apps include RideWithGPS, Strava, TrainingPeaks, Race Notes, and Komoot. The Wahoo ELEMNT does not use the propriety Connect IQ. However, it can connect to even more satellites, namely GPS, GLONASS, BEIDOU Galileo, and QZSS. Also, it will connect wirelessly to a wide range of apps, including Health app (iOS only), RideWithGPS, Strava, TrainingPeaks, MapMyFitness, Today’s Plan (Android), Komoot, Best Bike Split, SportTrack, and Dropbox. It too will wirelessly transfer your data. Both the Garmin Edge 520 Plus and the Wahoo ELEMNT offer live tracking – which basically means anyone can check where you are at any time, if you give them access. Both of these bike computers offers ANT+ connectivity. So you can connect the units to other devices, such as a cadence and speed sensor or a power meter or a heart rate monitor. You can also use Bluetooth Smart (4.) on the Wahoo ELEMNT and the Garmin Edge 520 Plus. These dual options make for wider connectivity options and lower drain on the battery. However, the Edge 520 Plus has some other connectivity options – you can use a Shimano wireless transmitter to connect with Garmin Vector 2S Power Meter Pedals, Di2 Dura-Ace 9070, Ultegra 6870 Di2, or Ultegra 6770 electronic gears. Again, if you don’t have these expensive add-ons, then you will not need to connect with them anyway! You cannot pair a Wahoo ELEMNT with an SRM PM6. Both of these bike computers will measure all of the data you want, depending on which sensors you have. They will also automatically upload your data to whichever apps you have selected, such as Strava or RideWithGPS. Both Garmin Edge 520 Plus and the Wahoo ELEMNT use button control, not touch screen control. Many people prefer button control. Personally, I sometimes find that screen swiping doesn’t work perfectly, especially in pouring rain. Button control gives you complete control, all the time, even with gloves on. It also has another advantage: if the screen gets muddy or wet, you can wipe it clean without having to deal with unwanted menus opening up! The Edge 520 Plus has 7 buttons, located as follows: 3 on the left edge, 2 on the bottom front, and 2 on the right edge. On the other hand, the Wahoo ELEMNT has three buttons in the front along the bottom edge, a power button on the left side, and up-and-down arrow buttons on the right side. You mainly use the three buttons in front when riding, and they are really easy to access. While both have a fair number of buttons, in practice you will use the Wahoo buttons less. This is the key factor that makes the Wahoo ELEMNT look like a more attractive unit than the Edge 520 Plus. You program the Garmin Edge 520 Plus on the unit itself, using buttons to access menus and sub-menus. This is fine if you are good at that sort of thing. However, you program the Wahoo ELEMNT using the excellent Wahoo app on your phone. Many users love the Wahoo app because it is so easy to use. 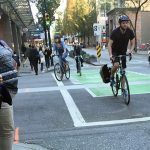 Using your phone to set up your bike computer options is so super easy and powerful that it made me question all the hours I have spend navigating bike computer menus (and sometimes swearing as I do it). If you love setting up customized data screens, you are most likely going to have a blast with your smart phone and the Wahoo ELEMNT bike computer! Plus, the process of pairing the Wahoo with my phone was so simple that it’s not even worth writing about it. Also, the zoom buttons on the side of the Wahoo ELEMNT are much easier to use than the zooming menu options on the Edge 520. These buttons can be used to zoom from 11 sets of data to just 1 or 2 – quickly and on-the-fly. You can also use them to zoom in and out on maps. 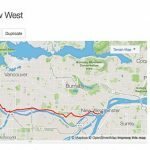 It is much harder to do this on the Garmin Edge 520 Plus – you will have to stop your bike and navigate menus. Which really means that with a Garmin, you had best decide what screens you want before your ride, and stick with them! The Garmin Edge 520 Plus has a beautiful color screen, and a great hand-feel – it feels very smooth, light, and high quality. The Wahoo ELEMNT is no ugly duckling, but it is definitely a little bigger and heavier, and simply feels and looks a little less high-end than the Garmin. Although the Wahoo ELEMNT is black and white and the Edge 520 Plus is color, it is actually easier to see the Wahoo ELEMNT, both at night and during the day. This is an interesting video made by a cyclist who switched from Garmin to Wahoo, and had mixed feelings about the change. 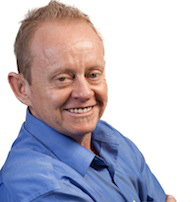 Tom Bell does international bike racing, and his YouTube channel offers many useful tips for bike training. A great little feature that is not seen on any other bike computers are the two rows of LED lights at the left side and top of the Wahoo ELEMNT. The left row is semi-customizable so you can program it to provide a quick way to see if you’re on pace with important performance metrics you set up, like speed, cadence, and power. The top row of LEDs shows notifications and alerts. Most notably, if you are following a route – even just a breadcrumbs route – these lights will blink red if you go off course, and blink green when you get back on course. Both the Garmin Edge 520 Plus and the Wahoo ELEMNT come with good, preloaded maps. Turn-by-turn navigation is not possible on either of these units on their own, as their maps do not have this metadata loaded. However, it IS possible to get turn-by-turn directions on both of them if you export a route that contains the required metadata from a suitable app to your unit. Such as RideWithGPS or Komoot. The created route will show up on both your Edge 520 Plus and your Wahoo with turn-by-turn directions! This excellent video from Clint Gibbs explains it. I recommend subscribing to Clint’s YouTube channel for lots of great reviews and insights. Although the video refers to the Edge 520, it is applicable to the Edge 520 Plus as well. Of course, you can pair your Garmin Edge 520 Plus with an indoor trainer using ANT+ FE-C and a range of training apps. See our picks for 5 of the best indoor bike trainers here. Both of these are excellent bike computers. Personally, I would choose the Wahoo ELEMNT over the Garmin Edge 520 Plus, simply because it is so much easier to program it with your smart phone, rather than navigating the endless menus of the Garmin Edge 520 Plus. It is also so much easier to see more or less data screens on the Wahoo ELEMNT, thanks to the zoom in and zoom out buttons. Plus, those LED lights are useful and fun! For most cyclists, the Wahoo ELEMNT really does have the “must-have” data covered, and then some. It used to be that the Garmin was way ahead, but really, Wahoo just keeps catching up. So, that factor is no longer important. The differences now come down to color vs. black and white; the zoom-with-buttons feature; programming with menus vs with your phone; and the fact that the Garmin Edge 520 Plus is a little smaller and more high-end looking. Both are great bike computers – my two personal favorites, in fact. Ultimately it will come down to what you think will work better for you. Good luck with making the right choice for your needs! I’m a newcomer in gps units. I have to replace my Polar cs 100. I hesitate between Garmun edge 130, 520+ and Wahoo bolt, Your review is one the best I have read so far. Thank you very much.